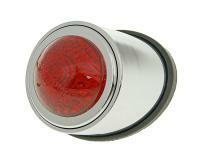 Round-edged LED taillight with chrome housing with M4 threaded bolts (requires 4mm holes to be drilled) and ideal for mounting to rounded bodywork parts e.g. : mudguard. 40mm diameter, 52mm housing. LED technology avoids multiple bulb changes.